Getting your MBA isn’t easy. It requires a lot of studying, writing, hard work and sacrifices. Students are often interested in any little bit of advice that will make the process more bearable. 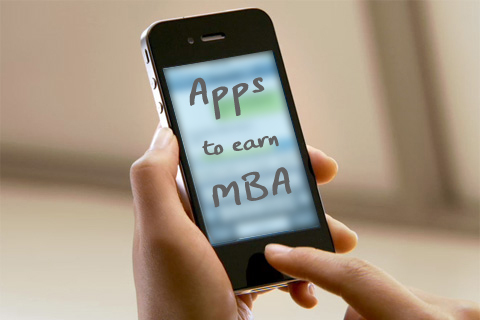 Here are some apps that can make getting your MBA a little less stressful. MBA students often have to keep up with what’s going on in global financial markets. Make the research process faster and easier by downloading this handy app. Online tools are available for market analysis, research news about financial companies is available, stock quotes and price charts will be at your fingertips and you will be able to analyze market strategies used by financial leaders. Group projects and study groups can be hard to coordinate, especially when you’re dealing with working students. Skype allows texting, calling, instant message, calls and CD quality sound. It makes it easier to get in touch with professors and other students. Many companies offer reimbursement for college tuition, plus all those MBA related expenses can be written off on your taxes. Use this app to keep track of purchases, loans and all those little extras that have to be purchased. It will remain one of your favorite apps even after graduation. Photos, screenshots, text and even spoken information can be recorded and categorized for easy retrieval. Fully searchable, this app makes finding the information quick and easy. It can capture anything you see or hear, providing you with instant access to the information from any location. The search features allow you to search according to keywords, tags or even handwritten text images. Take the organizer to the next level by adding the date wheel. It does more than simply remind you about assignments that are due. It actually has a countdown that tells you how much time you have left to get the job done. You can also use it to keep track of when shipments are expected, when tests will be and when those big papers are due. Handmade flash cards become a thing of the past with this app. You can create and share flash cards with this handy app. Studying will be easier, plus you’ll save time and wrist cramps by not having to write out flash cards. You can also import .csv files to make the process easier and faster. Covering topics like Business Strategy and Economics, the PocketMBA has seven main sections. Each one includes useful chapters, flashcards and even an exam. Progress meters show you how you are doing in the process. While it can’t be customized to help with your specific program, it can help you gain a better understanding of the important concepts. This app connects with the website and allows you to start networking for a new job. Ideal for staying in touch with students and professors, it can also help you network for a more lucrative position. Pursuing your MBA is challenging, and most students will make sacrifices along the way. However, these apps will make the process a little easier and less stressful. Whether you need instant access to world financial information or help making flash cards, these apps will enhance your entire experience.